In Greek antiquity, medicine was second to mathematics. Ancient Greek Civilization was at its peak during the 400's BC. During this period of time, sick people went to the temples dedicated to Asclepius, the Greek god of healing. At this time, a man named Hippocrates began teaching that every disease had only natural causes. He is known as the great ancient Greek physician. In medicine, doctors still refer to the Hippocratic oath, instituted by Hippocrates, who is also credited with laying the foundations of medicine as a science. Galen built on Hippocrates' theory of the four humors, and his writings became the foundation of medicine in Europe and the Middle East for centuries. The Greek physicians Herophilos and Paulus Aegineta were pioneers in the study of anatomy, while Pedanius Dioscorides wrote an extensive treatise on the practice of pharmacology. Hippocrates was the first physician known who actually considered medicine to be a science, and to be separate from religion. He wrote the Hippocratic oath, an oath that every new doctor-to-be still says to this day. It reflected Hippocrates high ideals. Hippocrates of Kos (c. 460 BCÐc. 380 BC) was an ancient Greek physician. He has been called "the father of medicine", and is commonly regarded as one of the most outstanding figures in medicine of all time. He was a physician trained at the Dream temple of Kos, and may have been a pupil of Herodicus. Writings attributed to him (Corpus hippocraticum, or "Hippocratic writings") rejected the superstition and magic of primitive "medicine" and laid the foundations of medicine as a branch of science. Little is actually known about Hippocrates's personal life, but some of his medical achievements were documented by such people as Plato and Aristotle. The Hippocratic writings introduced patient confidentiality, a practice which is still in use today. This was described under the Hippocratic Oath and other treatises. Hippocrates recommended that physicians record their findings and their medicinal methods, so that these records may be passed down and employed by other physicians.Other Hippocratic writings associated personality traits with the relative abundance of the four humours in the body: phlegm, yellow bile, black bile, and blood, and was a major influence on Galen and later on medieval medicine. The Hippocratic Corpus is a collection of about sixty treatises, most written between 430 BC and AD 200. They are actually a group of texts written by several different people holding several different viewpoints erroneously grouped under the name of Hippocrates, perhaps at the Library of Alexandria. None of the texts included in the Corpus can be considered to have been written by Hippocrates himself, and one of them at least was written by his son-in-law Polybus. The best known of the Hippocratic writings is the Hippocratic Oath; however, this text was most likely not written by Hippocrates himself. A famous, time-honoured medical rule ascribed to Hippocrates is Primum non nocere ("first, do no harm"); another one is Ars longa, vita brevis ("art is long, and life short"). The Hippocratic face is the change produced in the countenance by death, or long sickness, excessive evacuations, excessive hunger, and the like. The nose is pinched, the eyes are sunk, the temples hollow, the ears cold and retracted, the skin of the forehead tense and dry, the complexion livid, the lips pendent, relaxed, and cold. The Hippocratic face is so called because it was first described by Hippocrates. In medicine, clubbing (or digital clubbing) is a deformity of the fingers and fingernails that is associated with a number of diseases, mostly of the heart and lungs. Idiopathic clubbing can also occur. 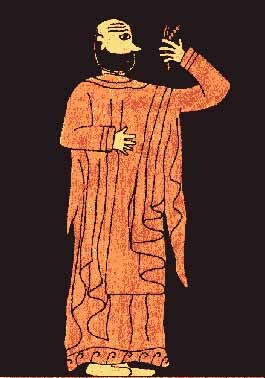 Hippocrates was probably the first to document clubbing as a sign of disease, and the phenomenon is therefore occasionally called Hippocratic fingers. The Hypocratic bench or scamnum was a device invented by Hippocrates (c. 460 BCÐ380 BC) which used tension to aid in setting bones. It is a forerunner of the traction devices used in modern orthopedics, as well as of the rack, an instrument of torture. The patient would lie on a bench, at an adjustable angle, and ropes would be tied around his arms, waist, legs or feet, depending on the treatment needed. Winches would then be used to pull the ropes apart, correcting curvature in the spine or separating an overlapping fracture. The Hippocratic Oath is an oath traditionally taken by physicians, in which certain ethical guidelines are laid out. It is thought to be written by Hippocrates by some scholars, but this is disputed and instead thought to be written by the Pythagoreans. One traditional version is below but there are others. Several parts of the Oath have been removed or re-worded over the years in various countries, schools, and societies but the Oath still remains one of the few elements of medicine that have remained unchanged. Most schools administer some form of oath, but the great majority no longer use this ancient version, which praises pagan gods, advocates teaching of men but not women, and forbids cutting, abortion, and euthanasia. Also missing from the ancient Oath and many modern versions are complex, new ethical landmines such as dealing with HMOs, living wills, and whether morning-after pills are technically closer to prophylactics or an abortion. I swear by Apollo the physician, and Aesculapius, and Health, and All-heal, and all the gods and goddesses, that, according to my ability and judgment, I will keep this Oath and this stipulation- to reckon him who taught me this Art equally dear to me as my parents, to share my substance with him, and relieve his necessities if required; to look upon his offspring in the same footing as my own brothers, and to teach them this art, if they shall wish to learn it, without fee or stipulation; and that by precept, lecture, and every other mode of instruction, I will impart a knowledge of the Art to my own sons, and those of my teachers, and to disciples bound by a stipulation and oath according to the law of medicine, but to none others.